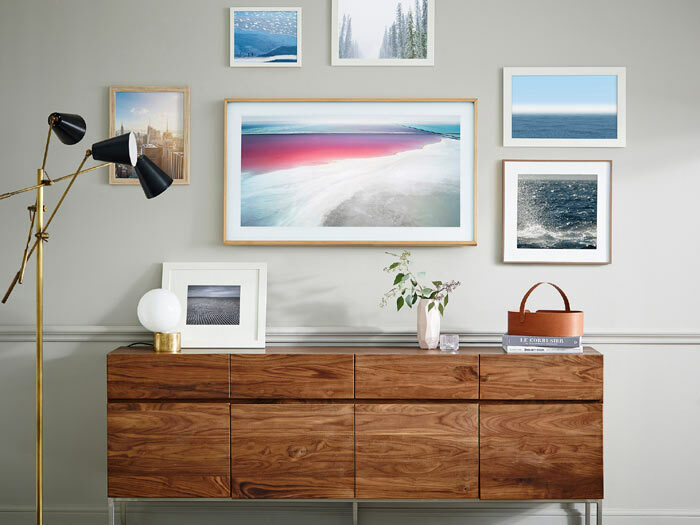 Samsung Frame TV, the new and most innovative Display. The Samsung Frame TV is a large display which fits into the size of a picture frame! When not in use, this TV will display art or photos instead of simply fading to a black screen. This creates a unique design for your interior, enabling you to have a 2-in-1. Below you can find some of the Specifications of this TV. 55-inch and 65-inch variations of this are available to purchase. The dimensions of the frame size are 68 cm x 121 cm (55-inch and 80 cm x 142 cm (65-inch). It has a 2GB ‘My Collection’ folder where you can upload your own images. There is a Companion App where art, images and other things like colour settings, ambient light sensing, and making the TV display switch off when users leave the room, can be adjusted via Wi-Fi. Samsung will also allow access to its Art Store for a one-off £14.99 fee or monthly £3.99 subscription. Currently, the Art Store contains 300 pieces. There are 3 different types of bezel colours you can get; Walnut, Beige and White. You choose your bezel for free, however, to get a new one it will cost £199 each. To discuss further needs with our team, email Support@IT-Supplier.co.uk. Alternatively, you can call the team on 0203 328 5655 for any product recommendations or general questions. Furthermore, the Samsung Frame TV is not currently available at IT-Supplier. Meanwhile, we will keep you updated on our social media pages once it is in our store and available to you. You will also be notified of different promotions such as Cashbacks and Discounts.